That's right, I'm in Chicago for less than hours. Came out to see the Jim Nutt retrospective at the MCA, "Coming into Character." Scandalously, it is not traveling outside of the city -- through know fault of the show itself -- amazingly (or actually not, if you're familiar with recent programming decisions by other major museums), no other institution would take it. I'll keep it simple: If you can, go see this show. It's the best single-artist retrospective I've seen in a very very long time. Maybe since Dieter Roth at MoMA - PS1 in 2004. Watching Nutt tighten his focus to intensely rendered and detailed imagined portraits is riveting. These are paintings that can be looked at for hours -- worlds of brushwork exist within each area of these images. Every mark builds on the next, and the intersecting planes and surfaces build to multiple crescendos. Nutt is a real modern master, and one whose early language in the 1960s was highly involved with flat, comic-strip/advertising rendering. He's very far away from that now, though one can still see a bit of the diagramatic Gould grotesque in him if you squint just right. Not that it's all culture here -- when I come to Chicago I roll with pal Ethan D'Ercole, who started me out with tacos, moved along to hot dogs, and finished off with deep dish pizza (the kind with the sauce on top, and, in a unique twist, a crust wrapped with carmelized cheese -- delightful). Anyhow, it's a quick blog from me today, since I'm traveling and also in a food coma. * Amy Poodle on Batman Incorporated #4. * This story is just sad, but obviously also infuriating and dangerous to the creators involved. Sad. * This is fun: A bunch of prelim and promo art for Marvel's Strange Tales II. * Bob Powell: A damn fine journeyman. Here's a 1944 war comic starring "The Spirit of '76". Tucker Stone on Jason Shiga's latest. And with that, kind people, I go back to digesting. Earth people, send us your event listings. As you may have noticed, we are publishing event listings. We wish to fill them up. So, direct your listing news to: events@tcj.com. We have uploaded issues 37 and 39-41 of ye ol' TCJ. Only 260 more to go. Almost there! But these issues are chock full of goodness. Issue 40, for example, has an interview with a young-ish Jim Shooter, just a little while before he was branded "Our Nixon." Kim Thompson, meanwhile, contributed a piece about Tom Sutton, and the great John Benson has an early (and very prescient) overview of Art Spiegelman's work. TCJ and Tom Sutton: A long term love affair. Issue 39 has a long piece on the now-infamous 1978 DC Comics contraction, a lengthy report on the then-comatose underground comics scene, and in the reviews dept., we have Kim giving Marvel 1970s-era Kirby a tough talking to, while Groth takes on Superman vs Muhammed Ali. And then issue 41 breaks open the Steve Gerber controversy, with a report and an interview with the man himself. The archive is still free for a little longer. And new content today and from the weekend. In his first piece (of many, we hope!) for us, Tom De Haven takes on the upcoming Gilbert Hernandez book; meanwhile Frank Santoro brings it for the third week in a row. His best layout piece yet. By the by, if, during the week you long for Frank, as Tim and I often do, you can click over to his Tumblr and check in on him. Most of you have probably already seen this NY Times piece on Marvel's publishing program. A little more business-y than I would've expected, the takeaway here seems to be that, uh, Marvel is trying... something, and that something is directed from the editors through the writers. The visuals in this visual medium aren't mentioned much, and neither are any particular creative strategies. Me, I'm still waiting for that New Universe revival. Via pal Dash Shaw we have two delights. First is this animated film by the great illustrator James McMullan, who taught Dash at SVA, along with a few other generations of other artists. His drawing lessons are actually online at the New York Times. His languid, elegant figures are just astonishingly well painted. More McMullan can be seen at Container List. Second, here's an online exhibition of the Art of Akira, along with commentary. Contributor Chris Mautner takes us to Comic Book College in the area of Frank Miller. This is a good start in some choppy waters. I'm glad Chris recommends The Dark Knight Strikes Again, which is my favorite Miller work, post-1990 division. Also, he reminded me that Miller actually wrote Robocop vs. Terminator. I can't believe there's not a movie of that already. I'd go see that. Thrice! Dapper Dan's Movie Review would have a field day! Finally, Harry Mendryk goes what we, around the "office" call "deep Santoro" with part one of an analysis of the Simon & Kirby colorists. And Joshua Glenn's HiLobrow continues to focus on Kirby with this fine piece by Adam McGovern. 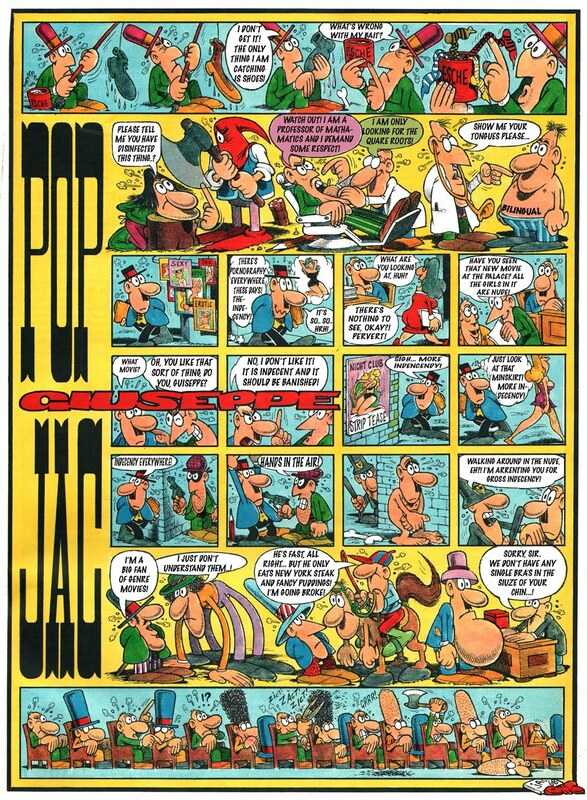 The Comics Journal has been the leading voice in comics criticism for nearly four decades. It launched its first full-fledged website in March 2011, and in celebration its editors, Tim Hodler and Dan Nadel, will lead a discussion on the history of the magazine and the medium of comics criticism with founding editor Gary Groth and longtime cartoonist and TCJ interviewee Kim Deitch. The bookstore will feature artist appearances and signings by throughout the day. More information here. *Here's a review I never expected to see: the often astonishing novelist William T. Vollmann writes about the Library of America's recent Lynd Ward collection in the latest Bookforum. Unlike the typical literary type slumming in the cartoon world, he even manages to take the form seriously enough to think out loud about how it works: "Graphic novels sometimes require of us the willingness to see and remember without comprehending right away." *Luc Sante also wrote about the collection, in Harper's. I let my subscription to that magazine lapse, so I can't read it until I pick up a copy, but Sante's always worth reading. *Eddie Campbell's one of the greatest talkers in comics -- and just might be interviewer-proof. Matthias Wivel's no slouch in his own right, and their resulting conversation is predictably solid. *Journal columnist Sean T. Collins points us to an interview with Phoebe Gloeckner, which contains a lot of new information on just what she's up to in Mexico over the last several years. *I remember seeing this once. I thought it was a dream. *Hans Rickheit would like your help. I will be on my way to St. Louis as your read this. I'm lecturing and doing critiques, etc., at my alma mater, Washington University, and also spending some time at The Modern Graphic History Library looking at Al Parker, Robert Weaver, and other greats of 20th century illustration. Plus, Kevin Huizenga and I will be embarking on a secret historical mission deep in the county. Exciting! But you don't care about me. What you care about is that I remind you again (until we get our FAQ page online) about our spiffy new comments policy. We realize there is no right fit for everyone, but we're reading your comments and discussing it all -- we'd like to maintain what we have, with these rules in place, for a little while. If we need to make changes, we certainly will. Thank you all for your interest. And you also care about links. Glorious, highlighted links! At the top of my list is Tom Spurgeon's eloquent case for voting Bill Blackbeard into the Eisner Hall of Fame. Without Blackbeard, comic strip history as we know it would be greatly impoverished. He pioneered the collecting and archiving of newspaper strips by literally driving a truck around North America and grabbing newspapers before libraries threw them out. His holdings supplied the bulk of the material we all now write about (and as Spurgeon noted, his generosity was unparalleled). Plus, his Smithsonian Anthology remains a cornerstone not just of comic strip culture but of visual culture in general. So, this is one time when it really matters. Give the man his due. Via Jeet comes this blog post about the discovery of a previously unknown George Herriman strip that may well be his very first. Some historical treasures to imbibe courtesy of Ger Apeldoorn: Mort Meskin's Vigilante and the always amazing Italian cartoonist Jaccovetti. Sean T. Collins reports on a good ol' fashioned DC vs. Marvel war of words. Here's a semi-revealing post on Comets Comets from the fake CF twitter guy, recounting his travails somewhat obliquely. Ironically, this matches nicely with a New Yorker article this week on a guy named Dan Bejar who imitated the musician Dan Bejar. Fake CF didn't share CF's name, but... well, fakery and imitations -- always more enlightening for the imitator than the subject of the "experiment". And finally, TCJ contributors Tucker Stone and Joe McCulloch present: Black Swan. Not comics, unless you count Darren Aranofsky's love of the medium and his killer collection of Hernandez Bros. art.